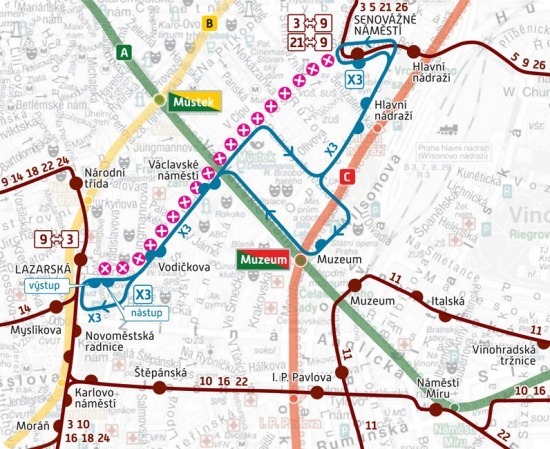 Due to a crane dismantlement in Jindřišská Street, the tram service will be suspended in the Lazarská – Senovážné náměstí section in both directions on Saturday, the 19th of March 2016 (from 5.00 a.m. to midnight). Line No. 3, in the direction from Nádraží Braník, is terminated in the Lazarská stop and continues further as Line No. 9 in the direction to Sídliště Řepy. In the direction from Kobylisy, the line is terminated in the Senovážné náměstí stop and continues further as Line No. 9 in the direction to Spojovací. Line No. 9, in the direction from Sídliště Řepy, is terminated in the Lazarská stop and continues further as Line No. 3 in the direction to Nádraží Braník. In the direction from Spojovací, the line is terminated in the Senovážné náměstí stop and continues further as Line No. 3 in the direction to Kobylisy or as Line No. 21 in the direction to Urxova. Line No. 14 is, in the Lazarská – Bílá labuť section, diverted via the stops Národní třída, Staroměstská, Právnická fakulta, Čechův most and Náměstí Republiky. Line No. 21, in the direction from Urxova, is terminated in the Senovážné náměstí stop and continues further as Line No. 9 in the direction to Spojovací. Line No. 24 is, in the Nábřeží Kapitána Jaroše – Lazarská section, diverted via the stops Čechův most, Právnická fakulta, Staroměstská and Národní třída. Senovážné náměstí stop for both directions on Senovážné Square, near the intersection with Dlážděná Street (in the tram track towards the stop, or from the Hlavní nádraží stop). Lazarská stop for both directions in Spálená Street (in the stops of night tram lines). Replacement bus service line X3 is established on the route Senovážné náměstí – Hlavní nádraží – Václavské náměstí – Vodičkova – Lazarská. For travels in the central city area we recommend using primarily the underground lines.